With the release of Shane Black's The Predator hitting theaters a few weeks ago, I decided to revisit the earlier Predator films (not the 2 AVP films) since it had been a long time since I'd seen them. More specifically, I wanted to revisit Predators, the quasi-Robert Rodriguez film that I didn't really care all that much for initially. I didn't hate it, but I didn't love it either. I just found it to be alright. 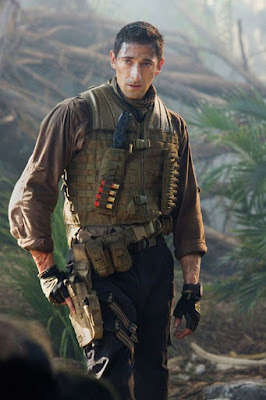 The two things I did walk away with were thinking that director Nimrod Antal (Vacancy) did an outstanding job shooting this, and that Adrian Brody, while an unusual choice, really did a badass job as the tough, no nonsense, unemotional hero. I was curious just where I was going to fall with revisiting this. Would I love it? Or generally feel the same? I loved it. It's a far better film than it gets credit for, and especially after the mess that is The Predator, I think more people will look back fondly on this easily dismissed, and often forgotten sequel. I'm just gonna say it. The Predator was awful. I can't believe it's from Shane Black, a writer/director I admire greatly, and Fred Dekker, who gave us some incredible classics in the 80's. To put it simply and shortly, The Predator looked and felt like a Disney or Marvel (Yea I know Disney and Marvel are virtually the same company) Predator movie. I felt the humor felt too forced and rarely ever worked, and while most people that did like the film state that they felt it was enjoyable enough (their words, not mine) and that it didn't take itself too seriously, I feel those are the reasons why it failed so miserably with the end result. I don't want to get into it anymore, but ultimately, I just wasn't a fan and found it to be easily the weakest in the entire Predator franchise, and this is coming from a Die Hard Shane Black fan. But moving on. 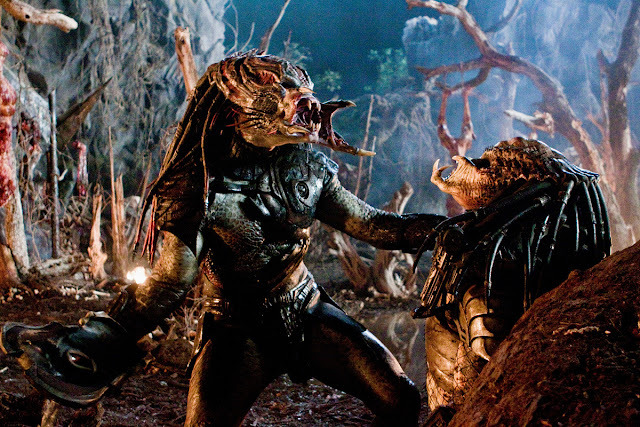 Predators was originally conceived while Rodriguez was making Desperado, and when the studio's passed on his take (which was ultimately pretty different from what we got here), they reached out to him many, many years later and wanted to go back and make that film he pitched to them all those years earlier, to try and re-ignite the franchise. Only Rodriguez would not write or direct it this time out, instead handing over the directing duties to Nimrod Antal, and the writing duties to Alex Litvak and Michael Finch, both of whom had never written a screenplay before. Instead, Rodriguez would stay on as producer and insist that it be filmed at his Troubleshooter Studio's, so he can have more creative control. To be honest, I think this was a wise choice as Rodriguez just isn't the badass director he once was. And I attribute that to his shift to digital filmmaking. When he made classics like Desperado and From Dusk till Dawn, hell, even The Faculty, he shot those on film, and they're easily 3 of his best films. Once he converted to digital, and began using shoddy effects work consistently and a whole lot of green screen, the quality of his films took a sharp downward spiral and outside of Planet Terror, I really have no desire to see any of his films. As much as I loved the fake Machete trailer and concept, when I saw the actual film, I was again seriously let down by it's poor use of bad CGI and lackluster filmmaking. It just didn't flow well and came across as half-assed and rushed, with a whole lot of shoddy effects work. So handing over the directing reigns to Antal was a brilliant move in my opinion. Predators works because it's simple, yet effective. There are so many nods and references to the first film that at times it almost feels like a direct remake, Predators follows the same tone and structure (more or less) to satisfying results. The cast, production value, effects, practical effects and action sequences are all great. In fact, this 2010 release really felt more like the kind of sci-fi/action film that would have been released in theaters in the 90's. It looks that good compared to the handheld/quick-edit crap that was flourishing in the 2000's that I hate so much. Visually, Predators is a feast for the eyes and you won't find a single lazy handheld shot in the entire film. It's a shame that director Nimrod Antal's career never took off after this, because based on his work alone here, he has the makings of a great action director, yet his career just sort of stalled. No doubt it's because of how poorly received this film was generally, but Antal has the goods and I wish he had been given more opportunities to prove it. The eclectic cast is pretty ace here, full of a bunch of badasses and weirdo's to keep things interesting, including the one and only Danny Trejo who's screen time was far too short, yet delivered one of the most memorable performances. But it's Adrian Brody who leads the charge and handles the role like a pro. Reportedly packing on 25 lbs of muscle to his thin frame (it's noticeable), he grunts, grumbles and chews his dialogue and scenes like a true hardened action pro, and definitely left an impression on me. 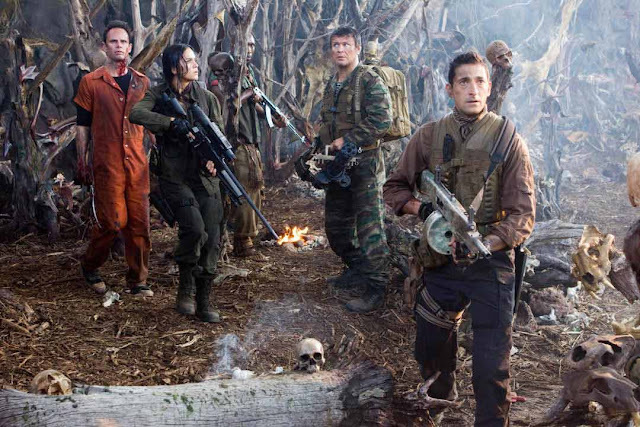 While it's true this film borrows so heavily from the first film that it oftentimes feels like characters, dialogue, sequences and even it's structure are lifted right out of Predator, there are also enough differences to make it it's own. So while the film feels awfully familiar at times, it's still a fun experience and a far better film than it's reputation has allowed. But most importantly, for me anyway, Predators is one helluva great looking film, so give it a watch and maybe this one will help ease the pain felt with the new one while it's still fresh in your mind.